DELAY LLAMA SUPREME GETS PREMIER GUITAR AWARD ! A great review for the Delay Llama Supreme by the great Joe Gore for Premier Guitar ! Premier Gear Award ! 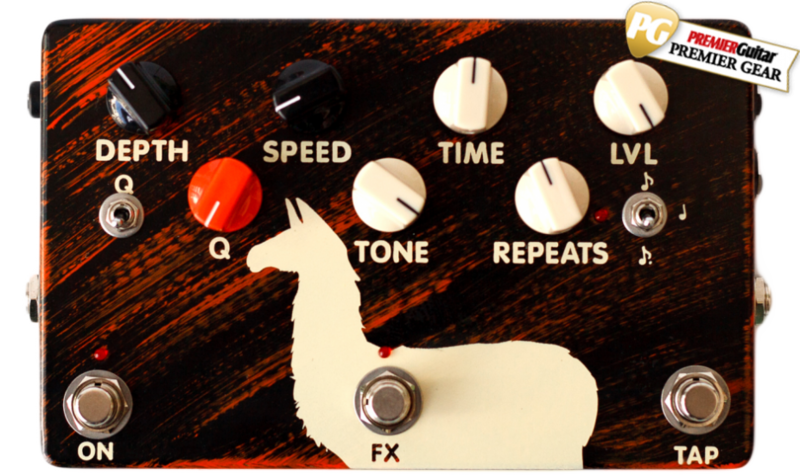 “JAM’s reimagined Delay Llama Supreme, which has more wrinkles than a litter of Shar-Pei puppies. Two traits distinguish analog BBD delays from digital ones: darker-toned echoes and a unique sort of distortion I’ve always thought of as “crumbly.” It’s easy to fake those dark tones digitally, but the quirky distortion is difficult to model. The Llama Supreme’s bells and whistles encompass some of the coolest features of previous BBD delays. The Llama’s large-format, hand-painted enclosure is whimsical fun, but inside, it’s all business. Jacks and switches are mounted to the enclosure, not the two circuit boards. The boards are densely but neatly populated with modern full-sized/through-hole parts. Have you ever peeked inside an analog delay? The number of parts is stupefying! Thankfully, this is a reassuringly solid build.